Some years ago I was lucky to stumble across a great tool for FS9 - Library Object Manager. It could do many cool things unheard of before, and I happen to become a beta tester for Jon Masterson. Today he is working on the ultimate scenery design tool: Airport Design Editor. Mighty by its features, it does everything according to the SDK and therefore produces clean code. Airport Design Editor (ADE9X) is a graphical design tool. It allows you to enhance existing FSX airports as well as to create new ones. Based on the design principles of Lee Swordy's AFCAD2, it has by now far exceeded the abilities of the FS9 tool by supporting the new FSX features. The coding for ADE9X is done by Jon Masterson, with a dedicated team supporting him in the development of the software. "ADE sets out to achieve two things in designing and enhancing airports. First to make the enhanced airport look good, and second to make it work properly. Airport design must address both aspects - the visible and the invisible. The design philosophy goes further in assisting users of all levels to get things right from the start. Error checking and 'common sense' are built in. At the same time it is important to allow users flexibility. ADE is being developed with the help of a small group of dedicated airport designers with a wealth of knowledge and experience." If you are doing scenery design, try ADE. Click on the picture below to visit Jon Masterson's Homepage. February 28, 2013 We have just released 1.55 This is a major update with a range of new features. * A warning box is now displayed on start up where the image complexity setting in ADE is not set to Extremely Dense. The user has the option to ignore the message in future. * Issue Manager now catches invalid Exclusion Rectangles where the latitude minimum is not less than the maximum and/or the longitude minimum is not less than the maximum. * Added a Compile Button top right next to the Design Mode Selector. This button is active when a project is loaded and when clicked will compile the project. * The list of Taxiway names (Designators) is now presented in sorted order in the toolbar drop down. * Time to Next Auto Save Visual Indicator. There is a countdown progress bar in the lower status bar area that displays the time left before the next auto save. The color of the bar changes as the time counts down. Auto save will only start when there are unsaved items in the project. * A ToolTip is available when mouse over Issues Button. This will list current issues if any. * A project tree that displays all user editable objects in a project. Navigating the tree allows the user to find and/or edit objects. * ADE now supports Prepar3D as a separate Sim version. This is reported as ADEP. * Moving Objects in front or behind each other has been extended. Changes in this are now remembered by ADE. * Night Lighting Mode. ADE will now show the airport at night including all the lighting. This is toggled on and off via the 'L' key. Most editing functions are available in Night Lighting Mode. * The methods used to handle positional data have been revised and updated. * Changed the handling of selection for aprons. In 1.50 the distance from the edge appeared to grow with zoom. This is now changed so that the visual distance from the edge of an apron or poly is contant irrespective of zoom level. * It is now possible to set pushback direction for parking spots. Although this is not honored in FS, some third party products make use of the information. * The Change Airport Altitude Tool will now ask if the user wishes to create a pre-load stub Bgl file for non stock airports. Stubs ARE required for stock airport altitude changes so this option is not shown in this case. * The Menu entry for List Libraries Used is now in the List Menu rather than the Tools Menu. * The following flags can now be set for all Scenery Objects (Beacon, Effect, Fuel Trigger, Generic Building, Library Object and Windsock) :- No Autogen Suppression, No Crash, No Fog and No Shadow. * Vertex display size can now be set by the user via Right Click > Display Options when a vertex is selected. The value set will also control the width of the edges drawn between vertices. * Locked objects can now be copied and pasted. The pasted copies are set unlocked. * It should now be possible to move airports over longer distances accurately. Thanks to motuslechat for pointing us to the Geodesy library created by Mike Gavaghan. * If the user has Load Last Project on Startup set to true and this project causes ADE to fail to start then there is no simple way for the user to get ADE to start. ADE will now turn off Load Last Project on Startup so that ADE can be started with no project loaded. * ADE now handles taxi links where either the start or end points are not found. These errors cause the compile to fail. On load ADE now checks for invalid taxi links and will remove them. If user action invalidates a start or end point then the Issue Manager reports it and will fix the problem. This should also deal with several CTD reports. * ADE will now remember the compiled file name. Currently this always resets to the default name each time a compile is carried out. The default name will now only appear the first time a project is compiled or if it is not changed. * FSX Vehicle paths are no longer highlighted when their taxipath designator is selected. * The parking spot tool tip shows airline codes associated with the spot. If there are more than five then the first five will be shown followed by '...' This is intended to avoid over large tool tips. In any case FS rarely honors more than a few airline codes at a spot. * The display grid is now drawn based on a given spacing between lines. The default is 500m (1500ft) however this can be set by the user. The drawn grid is centered on the current airport reference point and extends 50km in each direction (100km x 100km). The grid can be toggled on and off via the 'G' key. * User can now set the display color for a Flatten in FS9. * CTD when double clicking an entry in a List. * CTD when using the Undo button. * CTD when selecting parking spot placement mode. * CTD when drawing runway. * CTD when drawing Background Image. * Latitude parsing CTD when latitude is only a single character. * Terrain Polys should no longer appear on project load if they are set to be hidden in the view menu. * It is no longer possible to drag a taxi link if either the start or end nodes are locked. * Problem that stopped user from deleting all airline codes from a multiple selection of parking spots. * CTD when trying to delete an object. This is reported as an Index Out of Range error and was caused by the drawing code. * Multiple selection of vertices using the Shift Key now works. It is possible to drag and/or delete multiple vertices. Rubber band selection of vertices is currently not possible but is planned for a later release. * CTD when trying to add a Fuel Trigger in ADEX. Probably caused by more than one object being selected or an unexpected double click. * The appearance of the 'Delete Failed' message should no longer occur. This was a bug caused by selecting an object and hitting the delete key more than once. * VOR/ILS without idents result in a compiler error. The Issue Manager now identifies these and will allow the user to fix them. It is no longer possible to create a VOR or ILS without an ident. It is no longer possible to edit a VOR or ILS to remove the ident. * NDB without idents result in a compiler error. The Issue Manager now identifies these and will allow the user to fix them. It is no longer possible to create an NDB without an ident. It is no longer possible to edit an NDB to remove the ident. * Bug that caused display to pan at greater rate than the mouse move after disconnecting from FS. * Cardinal runway idents are now displayed properly in ADE. * Rubber band did not work over Background Image. The method of selection for images is changed to fix this problem. Selection is now possible only on the edge. * The Issue Manager now reports any parking spot airline codes that exceed four characters in length. Any codes over four characters will cause a compiler error. * Issue where ADE reports wrong library object footprint size in property dialog where dimension units are set to feet. * Inconsistencies and errors generated in Starts, ILS and taxi links when a runway is re-numbered. * Incomplete undo/redo for Starts, ILS and taxi links when a runway is renumbered. * CTD where ADE is trying to open the users default internet browser and cannot. * We have updated the way ADE handles effects. The program needs access to the Effects Folder in FS. If it cannot find it then it cannot add or edit effects. Messages are now displayed to advise the user of this problem. * Bug where un-checking ProKey in the Add in Manager does not turn off the ProKey. * CTD when selecting an object. We are not sure what this is. It has been reported many times but we cannot replicate it. We have added some code that should stop the error. We will monitor for new reports of this. * CTD when trying to add a thumbnail to the Library Object Manager using an existing file. Note that trying to use a texture will almost certainly cause this problem. ADE now displays a message rather than crashing. * CTD if the user hits the Delete Key while dragging. * CTD at the end of a drag. We cannot replicate this but we have added some code that should stop the CTD occurring. * CTD when user clicks the Fault Finder Close button while a scan is in progress. * CTD when trying to add an approach to an airport that has no suitable runways. * ADE9 can generate airport flattens for FS9. * The tooltip can be temporarily hidden by holding down the 'Q' key. This can be used if the tooltip gets in the way of what you are doing but you do not want to turn it off. * Display Options for taxi points allow setting of drawn diameter. * Issue Manager now reports models where the path cannot be found and allows the user to enter a new path. * Users can no longer turn on Skip Compile at the Project Level (such changes will be ignored. ADE will always compile the project). * Display options for taxi links restored. * CTD where Bgl compile fails silently. * CTD where the parking number is greater than 999. The limit has been set to the correct limit of 3999. * Edit button is now active for multiple selections of parking and tax links in List. * CTD where the Arial Narrow Font is missing from the user computer. ADE now issues a warning on start-up and will not draw runway IDs if the font is not found. * CTD with FS9 Extended Compile Plugin. * CTD where user switches to Approach Mode when cursor is not pointer. * CTDs where user is allowed to work after a File Failed to Load error. ADE will now set a clear screen. * CTDs where the Right Click Menu may be activated when there is no project loaded. ADE no longer displays a context menu if there is no project loaded. * Problem with dimensions of Generic Buildings. * ADE requires dotNET Framework v3.5 to run. If not this cannot be found ADE will display an error message and will no longer start. * Bug that appears to come from the drag handler and reports an object no set to an instance. * 'Nudge' objects for accurate placement. Arrow keys may be used to nudge objects or groups of objects by as little as 0.01m (4 inches). This is a ProKey feature. * Changes to the load sequence that should save a few seconds during application start. * Removed the coordinate display from the lower status bar. This replicates the display in the main window and maintaining it caused unnecessary performance degradation. * Invalid parameter error when loading background image. * Out of Memory error when loading a background image. * Background Images loaded form an existing project appears blocky. * Object not set error from tooltip. * Object not set error from dragging mouse. * Risk that some manual unzips may not copy empty folders. ADE will create required folders if missing. * Large pink circle filling screen when nearby airport is selected. * Stopped CTD when deleting some objects. ADE will now display an error message. This is not the final solution. * Issue Manager Performance. IM running in background impacts on cpu usage. The IM should no longer impact on overall performance. * The Rubber Band selector is active in Approach Mode. * Duplicate waypoints are now identified by the Issue Manager. * Clicking the Issue Manager Status button at lower left of screen when no airport is loaded no longer results in a CTD. * Custom Hide. This is a ProKey Function only. Users can select and hide individual items in the display. These items can be temporarily displayed will a key is pressed, individually restored or all restored. ADE remembers what objects are individually hidden between sessions. * Resize the aircraft symbol. Users can now re-size the airport symbol when present. This is manually changeable to suit the user and makes it easier to handle accurate placement when ADE is zoomed in. * List Third Party Libraries Used. Provides a list of third party library Bgl files that are used in a project. * Many lists now allow multiple selection using the usual Shift and Control mouse clicks. When a list allows multiple select shown below the item count and two buttons are made available (Select All and Clear All). The use of multiple select in Lists is to allow users to delete the selection. * Multiple Select in Display. This is now generally available using the Shift key when selecting objects. * Rubber Band Selection. Objects can also be selected in a group by left clicking an open space and dragging the selection rectangle. Single point objects will be selected when the box covers the object reference point. Objects with vertices such as aprons require that all vertex are covered by the box. This means that rubber banding can be used over an apron to select parking spots etc. * Multiple selected objects can be dragged as a group. This action can be undone. Note that the code handling multi object dragging is not the most efficient so it should be used only for small groups of objects. Also there is a visual bug in Undo of dragged taxi points. This is erratic but sometimes the surface and markings associated with the point are not drawn correctly with the Undo. This is cosmetic and is corrected when the point is mouse-overed. The problem seems to relate to the third party graphics engine used and all attempts to fix it have pretty much failed so far. * Send Log. Users may now send the application log directly to us. This can be done via a button in the Options Dialog or if there is an application error and ADE needs to close. No personal information is sent other than the user initials are used as part of the file name. * Workaround to stop ADE crashing if the user selects multiple taxi paths and then tries to set the default color. This now displays an error message but does not crash. * Copy and Paste Extended. Copy and Paste now covers most objects. The following cannot be copied: Airport Reference Point, Taxi links, Taxi points, Background images, Starts, ILS, Way points. Copying VOR and NDB will open the property editor and the user must change the Ident to avoid a compiler error. * The Logging mechanism is being replaced. The old text log is no longer created. A now log is generated with a binary format (one in FS9 and one in FSX) name is Log.tx1. This log is generated new each time the program is started (this is development behaviour (production behaviour will have a log that persists with a maximum size). This new logger is much more powerful than the old one. * Editing Vertex is now available. However it generally only allows the manual setting of coordinates. * ADE not loading stock scenery objects for Navaids located at the airport. ADE was not checking the stock Navaid files for objects. * Airport Level Locks now honor the 'Locking Disables Edit' option. This means that an airport level locked apron cannot be moved or deleted but can be edited if the Locking Disables Edit option is not set. * Dragging large number of objects especially nodes is very slow. No drag animation is likely to appear. Drag slowly and wait for the display to catch up! Some opportunities for performance enhancement do exist. * Visual bug in undo of moved taxi points. The surface and markings may not draw correctly. These restore if the mouse if placed over the node. This is erratic and may not be seen. This update is for ADE version 1.40.07. If you have an earlier version then please first download the full 1.40 installation from www.downloadcenter.scruffyduck.org.uk and then apply this update. We are delighted to announce the release of Airport Design Editor Version 1.40. This is a significant new release with a number of bug fixes, enhancements and new features. The major new function is the Visual Approach Designer. We have enhanced a number of areas including the range of co-ordinate formats that can be used when entering locations; runway length of greater than 20,000ft are now allowed; inclusion of no crash and no autogen suppression of objects; locking of objects groups such as runways or aprons is now specific to each project. We have fixed many bugs including the one that caused ADE project files to grow in size and the one that caused objects to move after setting their position manually. * Automatic ILS Approach Added with new User ILS. We have just made Version 1.37 available. This will be the last patch update. The next Version will be a full release version. 1.37 is available via the automatic updater and we will upload it to Flightsim sites shortly. 1.37 is primarily a bug fix release but does have some new functions. Please note that this version will ask you to re-create your stock databases. DO NOT SKIP! Failure to re-build the databases will cause ADE to crash. There is new database. Please not the new Help System. It is a new on-line system and very much a work in progress. We have made it available since it covers new functions and also as an adjunct to the manuals. If you cannot find what you are looking for in this system then you will need to use the manual and release notes. We hope to have the new system fully operational for the next full release. We are pleased to announce the update to 1.30. This contains several fixes and some new functionality. Is is available from versions 1.20 thru 1.26 using Help > Check for Updates. Note that this is not a full installation and requires version 1.20 or later to already be installed. We are very pleased to announce the release of an Update to Airport Design Editor. This update will bring either 1.20 or 1.22 up to 1.25. There is no need to remove the 1.22 update before applying the new one. This version deals with a number of bugs and also adds some significant new functionality. Full details below. Available via the on-line updater but should be available on AVSIM and FlightSim.Com shortly. We would appreciate you getting it from the external sources as this will reduce the bandwidth demands on our server which are currently rather high. ScruffyDuck Software and the ADE Development Team are delighted to announce the release of Airport Design Editor version 1.20. This is a significant upgrade to the Program and contains many fixes and functional enhancements. It also sees the merging of Home and Pro Edition functionality. As of version 1.20, there is only one edition of ADE. Major new functionality includes the creation and manipulation of terrain elements such as airport backgrounds, land class and exclusions. There is not longer any need to use a separate utility to modify the terrain at your airport. Also ADE now loads the generic buildings, library objects, windsocks and fuel triggers with a stock airport. Once included you can move, delete or otherwise modify these items and ADE automatically takes care of excluding the stock objects. You can add stock library objects and ADE makes it simple to accurately enhance your local airport with easy access to around 450 common objects including library objects, windsocks and fuel triggers. Other enhancements include copy/paste; display the XML code for the airport or any object, and automatic updating of ILS, Starts and runway links when a runway is renumbered. ADE 1.20 is delivered via an installer that also allows you to download the tutorials. A new installation and configuration tutorial is released alongside providing information on setting up this new version. 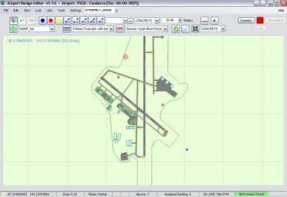 Airport Design Editor 1.20 is available for download from AVSIM, FlightSim.Com and the Airport Design Editor site. Bob Kesshan has invested a tremendeous amount of work to create so far three tutorials for ADE. He has gone to great lengths to present the basics of airport design in a very comprehensible way. These manuals can be selected as a download option when running the installer. Helmuth Hauck has made an excellent German Manual which will be part of the installation package for the new 1.40 Release. All updates for the English manual of Release 1.45 are also done by him.